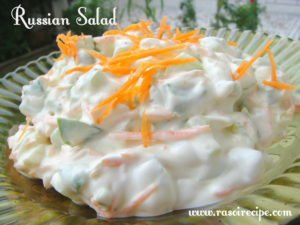 Today’s recipe is ‘Russian Salad’. This is salad recipe is a quick 15 mins recipe. 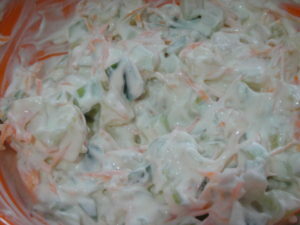 You can have russian salad any time of the day as a small meal or with any of your meal. You can also give this salad to your kids, if you find it very difficult to include veggies in your kid’s diet. 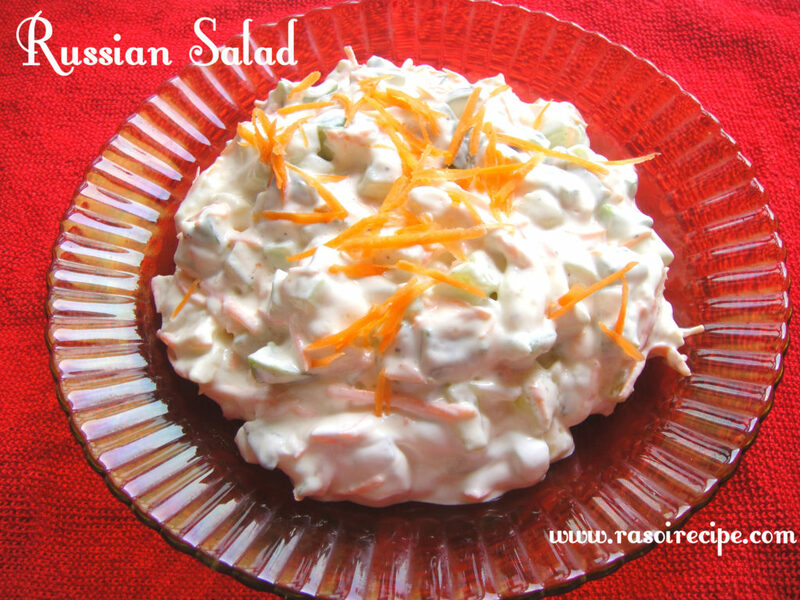 This recipe of russian salad is an eggless version, if you are an eggetarian or non vegetarian you can add boiled eggs in this recipe. Even mayonnaise used in this recipe is eggless mayonnaise. Boil potatoes. Chop the potato in small cubes. Wash all the vegetables and apple. 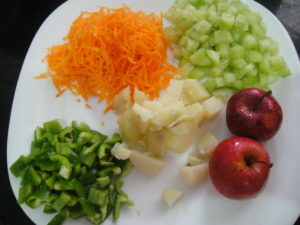 Cut apple, cucumber, and capsicum in cubes of equal size. Shred carrots. 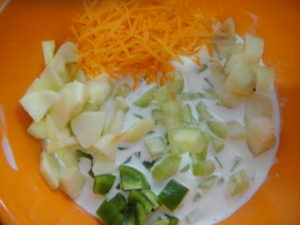 Take a big mixing bowl, add cream, vegetables and apple in it. 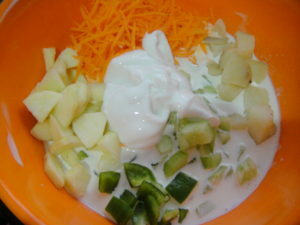 Add eggless mayonnaise in the bowl. Add sugar, salt and crushed black pepper in the bowl. Mix well. You can either serve immediately or refrigerate and serve later. 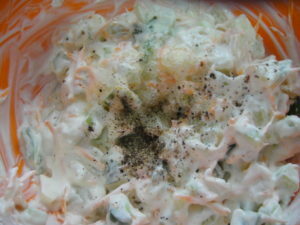 Veg russian salad is ready, garnish with shredded carrots and serve ! Other veggies that you can use for this salad are boiled sweet corn, boiled peas, pineapple and beans. Add boiled eggs in this salad recipe, if you take eggs in your diet. Skip sugar, it is optional, if any health issue. Aww I am so happy to share it. Yes it is very easy and quick to prepare recipe. The best part is you can add your fav. veggies and enjoy it. It reminds me a lot of a potato salad! With lots of other goodies added to it! Looks like the perfect Summer side dish! I love how simple your recipes are Alisha. Keep them coming! My aim while starting this blog was to keep my recipes simple and less time consuming yet delicious.